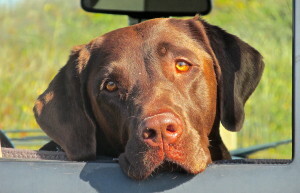 Wherever I go I like to bring River, my Labrador retriever, with me. She is a great traveler, fits well in my 2006 Ford F-150, and enjoys seeing new places, especially those involving the outdoors and water. The other day I took her with me to practice 3D shooting. 3D archery is one of her favorite pursuits. 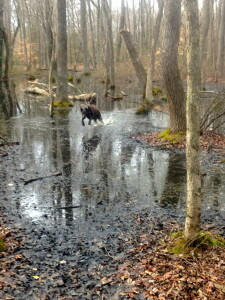 River and I generally go to Schrader’s Outdoors in Hendersonville, MD to practice 3D. In the warm months they have a 30-target course, which they reduce to 20 targets over the winter months. (The price to use the range remains unchanged despite the seasonal target reduction) On their range they have a number of stands from which to shoot; some that are fairly high. 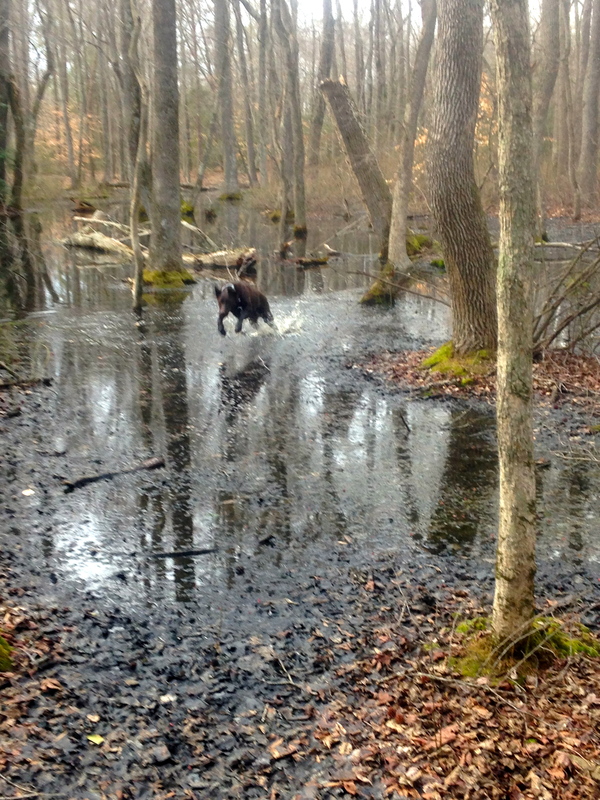 The land is low and there is often sitting water near the course that is webbed with small ditches and creeks. At each stake, as I prepared to shoot, River trotted up to the target, gave it a measure and headed back to me where she then stands or sits at my side while I shot. Often she whines, growls or barks instruction as I aim. The minute I’ve completed the shot, she runs to the target to view the arrow placement. Good shots or bad shots never receive any more praise or condemnation than a sniff. As I hiked from stake to stake, River ran ahead hitting every bit of ground that was covered with standing or running water. When I approached the stakes she repeated the process of trotting up to the target, taking her measure, then returning to her sitting or standing position beside me. By the time I notch an arrow her complete focus is again on my posture and preparation. At some targets she utters a whine, growl or bark and at other targets she remains silent. Stands are a game for her. 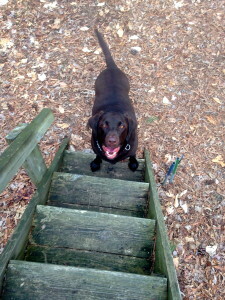 As we near any stand she runs to it, places her front paws on the second step, turns her head and watches my approach. There is no keeping her out of these stands. 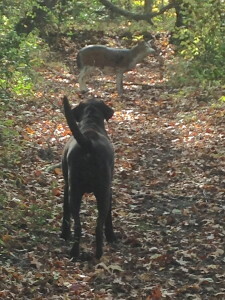 She is either first up the stand, or climbs them after I am in place, her rise shaking the stand as I prepare to shoot. Occasionally a stand requires her ascension and descent before I am allowed to embark. No matter what, whining and barking aside, after the shot she invariably runs off, from a stand it is scary how fast she descends, to view my arrow placement up close and personal. The whining, low growls and barking I am only now beginning to comprehend. On this trip to Schrader’s they had 20 targets arranged on the course ($15.00 fee regardless of the 33% depreciation on targets). 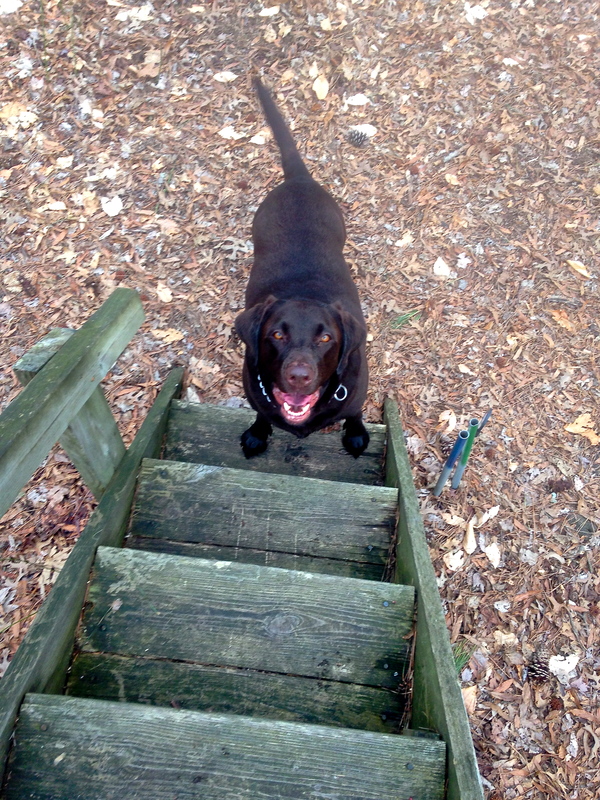 River barked, whined, growled or made some other announcement 10 out of 20 shots. On the 10 when she was silent I shot an 11. On the 10 when she chose to communicate with me I shot an 8. It seemed she was trying to coach me when she recognized I was about to shoot something less than an 11. River seems to understand good versus bad form. Departing from the Schrader’s 3D range River, having left no puddle, ditch, creek, stream, or pond unmolested, was completely soaking wet. She’d climbed every stand, measured every target and provided what I now expect is archery coaching. It was a big time for her. My ten 8’s made my day less big. After putting it on the line we’d arrive home in wet dog smelly truck. I race. I compete in running races, cycling races and swimming events. Going fast and far is fun, so I am never still for long. 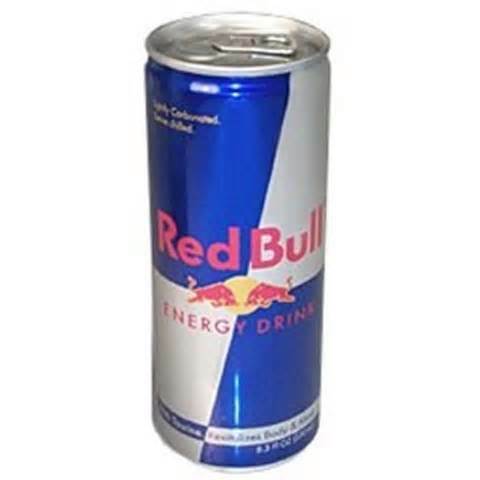 During my training and during races, I ingest masses of caffeine and drink a large amount of Red Bull. 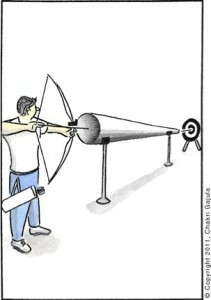 My caloric intake of caffeine and my archery maintain a tenuous collaboration. Case in point: I had an intense training schedule and a serious archery competition on the same day. The archery event was last on my agenda. First on the calendar was a 10K-morning run, then, in the afternoon, a 40-mile bike ride. The final activity of the day would be an archery tournament. After breakfast I knocked out the run in under an hour and between the run and ride, I completed some work. Within all that activity, I had lunch and took a short nap. I think it is inhumane to ‘get busy’ while digesting. The 40-mile ride was a few hours before the shoot, and I needed calories and a caffeine boost. A windy day on the Eastern Shore, it was going to be a gut buster to complete the ride in the time before heading to the shoot. Plus, I was hungry, again. It is not good to start a ride with no fuel to burn. Bonking is not pleasant. A pre-ride double espresso along with a PB&J on an English muffin did the caloric trick. Knowing my calorie count for the day remained low; I grabbed a 2X Caffeine GU and stuffed it in my jersey. Now prepped for riding, I headed out on my Cannondale Slice. At mile 28 I’d burned about 800 calories so I sucked down the 2X Caffeine GU. These GU gel food supplements taste awful, their consistency is gag worthy, but they provide fast energy. The 2X caffeine gives a real kick particularly when washed down with Red Bull. (Sometimes, that day in particular, I carry Red Bull in one of my water bottles) I’d finished the 40 miles in a tad more than 2 hours. Back home I grabbed another Red Bull, drank it, doffed my riding kit, showered, dressed, hopped into my Mercedes SLK Super Sport and headed to archery competition. During the 35-mile drive to the range, my iPhone linked to the car stereo for music, I cranked up my “running” play list. That list of music is hardly sedate. Cruising in the SLK is always exhilarating, and I was really feeling pumped. I was headed to an archery shoot, Red Bull, coffee and 2X Caffeine GU coursing through my veins, driving in a sports car – living the dream. I’d planned to arrive at the range a bit early for a good warm-up. If I’d been arriving for the start of a sprint triathlon I could not have been more warmed up. Hitting the parking lot, stereo booming, with 30 minutes to spare I was race ready. But, I needed to change gears and become archery ready. Heading in, feeling charged, I put the sight and stabilizers on my bow, grabbed arrows and stepped up to practice. Firing off a few practice arrows it was apparent I was race ready. Caffeine increases your mental alertness. Only a few hours before shooting my bow I’d caffeine loaded. My brain was alert. The pre-shoot Red Bull was certainly working as a solid maintenance dose of caffeine. Actually, I typically drink a Red Bull within 30 minutes of every archery competition. In practice, I often drink one beforehand. My scores and practice seem unaffected by Red Bull. It is unclear what this implies about those scores. Archery isn’t like running a 40 K trail race in the freezing rain in February over ice slick red clay in Georgia. And it certainly doesn’t compare to a parachute jump from space. But, archery has its own thrill. The feel, the calm, the focus, and intensity under control, which apply in archery, also apply to more vigorously dynamic sports. Archery does provide me calm and focus that I carry into other sports. 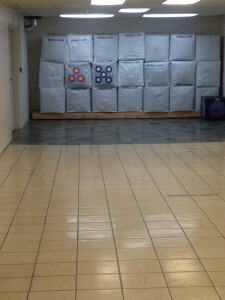 Once I hit that zone, my shooting becomes relaxing or my racing controlled. My score for that Red Bull invigorated night was 294 with 11 X. Not my best score, not my worst score. Whether or not it is advantageous having a heart rate of a hummingbird in archery is debatable. Prior to the shoot I’d run, biked, and mega-dosed on caffeine and energy drinks. How that impacted my shooting I honestly don’t know. I suppose it is relative or relates to what one is accustomed to having in their bodies and how that body is used. Frankly, the only times I am still are when I am asleep or putting it on the line, caffeine, Red Bull and all. Archery Lesson 2: Remember everything you bring to the range and don’t leave it there. I learned lesson two a few weeks ago in Murrysville, PA, after I forgot a couple of items on the range. This past Saturday, I retrieved those items, a mislaid quiver and belt. 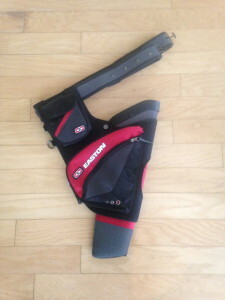 The quiver and belt were presents from my wife – even more important I got them back. 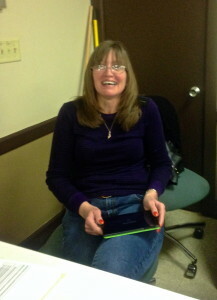 Sherry had been working the tournament at the Crowfoot Sportmen’s Club when I competed there in early March. It was a well-run fun event. Following the shoot I partially packed my gear and headed back to Maryland. Someone in Pennsylvania found my unpacked gear and gave it to Sherry. Luckily, my quiver had an old score card in the pocket which is how Sherry identified the forgetful owner, me. She called the next day to let me know she had my stuff. 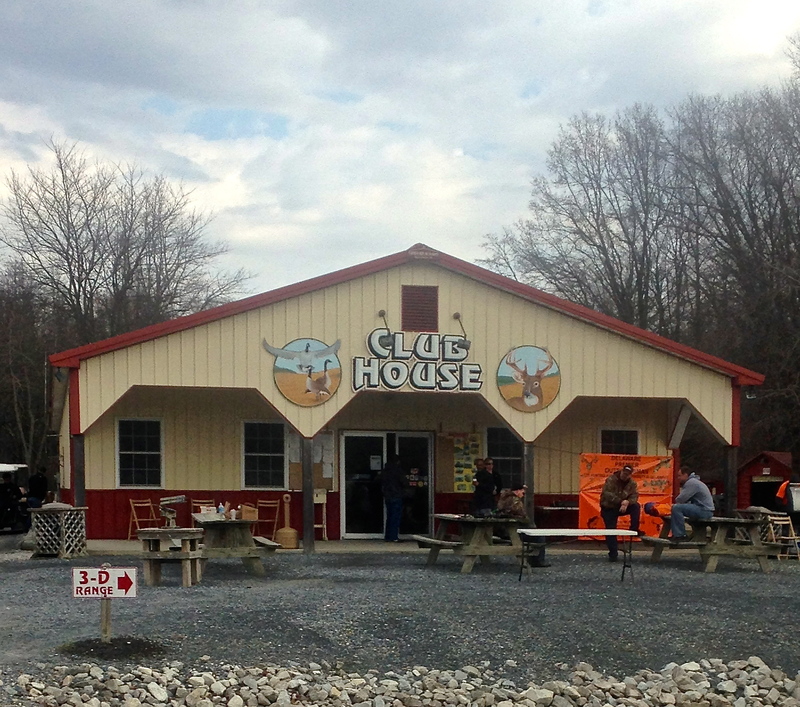 The Crowfoot Sportsmen’s Club in Murrysville is on the western edge of Pennsylvania. My home in Easton, Maryland, is on the Eastern Shore. The distance between the points is about 300 miles. Fortunately, I was heading back to Sherry’s neck of the woods in a few weeks. Twenty-two days after her call I was meeting Sherry for a second time and collecting my previously forgotten property. Sherry was working another tournament at the Crowfoot Sportsmen’s Club. The range was packed. Seeing all the shooters made me envious. If that day had not been my grandson Merric’s first birthday celebration, my reason for being in Sherry’s neck of the woods, I might have been shooting at the tournament. Thanks to Sherry and the other good folks at Crowfoot Sportsmen’s Club for taking care of my stuff. I’ll try not to leave behind other things of mine during future shoots at Crowfoot Sportsmen’s Club or any other range for that matter. It was great to get the gear back. 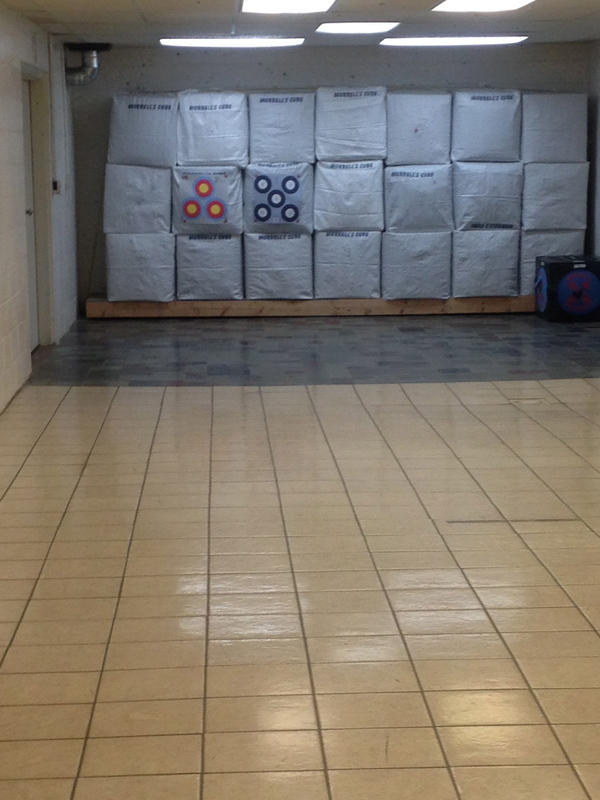 At the indoor range where I was practicing there was an archery coach and his associate available to provide help. These range fellows were old and a bit rough around the edges. I had a technical question and their opinions might be interesting. When the words, “Is glare a problem when using a lens versus pin sights while shooting outside?” left my mouth, I knew asking was a mistake. That simple question initiated an unrelated lesson in Japanese archery. The range coach started to address my query. Before he’d finished, his confrère barked, snapped and began harping about the Japanese. On and on he lectured about the greatness of the Japanese archer. The sermon exhausted the concept that Japanese don’t allow novice archers to shoot an arrow until they’ve mastered 1000s upon 1000s of draws with an arrowless bow. His point, having little to do with the technical question I’d asked, was that an archer’s form is paramount for accuracy. (The grizzly colleagues would never return to the question of glare on a lens) Curious about the technique of drawing and letting down an arrowless bow for 1000’s of repetitions, I searched the Internet for information. When drawing and letting down an arrowless compound bow there is bound to be trouble. Sooner or later there will be a dry fire. The Japanese act of practicing with an arrowless bow needed clarification. 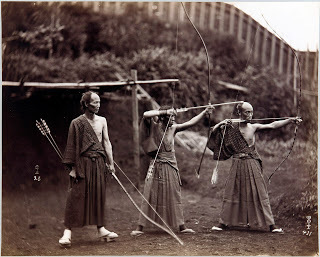 What I found was the Japanese practice of Kyudo. While mastering archery form the students of kyudo practice bowless. This brings to my mind “air guitar”. But, the students do graduate to bows and no arrows. Bow should be drawn and released without an arrow. 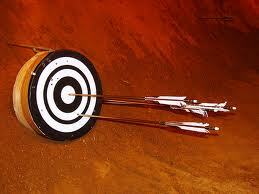 For practice without an arrow students of kyudo may use rubber bows to make 1000’s of arrowless draws less risky. Eventually, kyudo students get to shoot arrows. Online there was a video example of kyudo archery in which modern practitioners demonstrated battlefield technique. The lighting in the video was such that the flight of arrows is visible. I have included the video for your review. At 2 minutes and 25 seconds notice the archer closest to the left and his arrow. The arrow flies off his bow at a 45-degree angle. Watching the Kyudo practitioners it is obvious there is no Japanese archery secret. Cultural superiority is an archery myth. The folks I have practiced with from Japan, Middle East, and the US all performs about the same. They all practiced about the same. Just like Americans, they all practiced their form. Just like Americans there were good shots and bad shots. The old fellows at the range never answered my question about glare in the lens versus a non-lens pin sight. They were busy talking over one another and distracted from the issue when I left them bickering. Busy glorifying the mystery of Japan. As for the question that started it all: If I don’t use a lens, I won’t get glare from the lens. You know the quote about “best laid plans of mice and men,” well my plan was soon to be unexpectedly diverted off course. 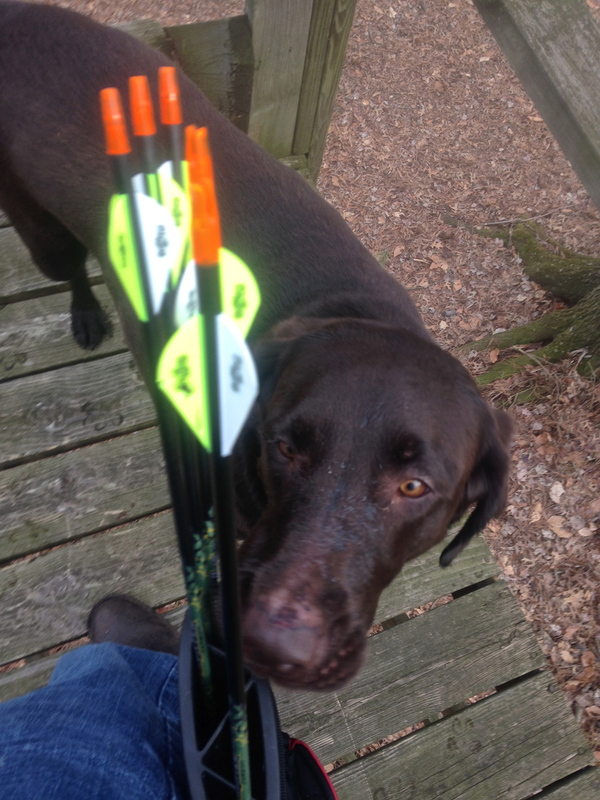 My plan was to begin outdoor training for the 2014 3D archery competition season. Winter at my home in Easton, MD had been rough and would not move on for spring. There had been too much snow, too much cold, and too much ice. Accordingly, indoor archery practice became my genre of choice. Avoiding the cold, I’d gotten pretty good at sizing up 20 yards. But, I needed to get outside and practice. My plan got busted. At long last Easton had a day that was sunny and 60 degrees (it wouldn’t last long). I was getting outside to shoot while the getting was good. 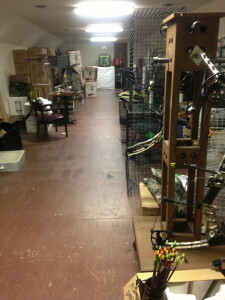 I loaded archery gear into my 2006 Ford F-150 and drove to the Tuckahoe Bowman’s outdoor range in Queen Anne, MD. Arriving at the entrance of the range, a locked gate barred my access. It was time to become flexible with my plan. 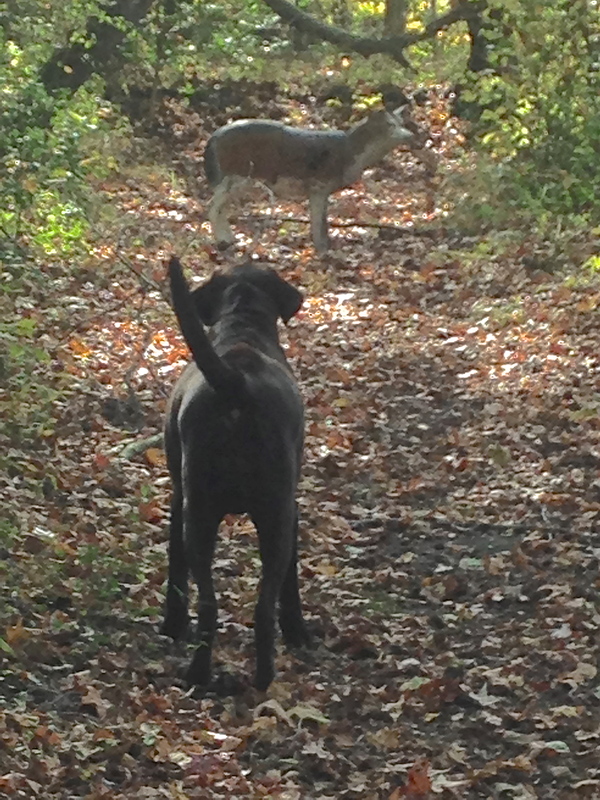 Plan B was a trek to Schrader’s Outdoors and shoot on their marked field targets. When I reached Schrader’s in Hendersonville, MD the parking lot was filled to near capacity. Attached to their Club House was a large banner announcing something I couldn’t read from the far end of the parking lot. In the lot, I noticed a parked pick-up truck with its tailgate down and on it a bow case and assumed someone else was there to practice. Located beside the Club House, Schrader’s has several flat targets with marked yardage and a 3D range. Until I had some yardage practice, I was sticking to flat targets at known distances (or so I’d planned). Having to park a few hundred yards away from their Club House I hiked in to make my arrangements. On the front lawn, more correctly the front gravel, of the Club House there were picnic tables covered with compound bows – I wondered what was going on here. The banner, previously seen from a distance, now close, revealed no clues, so I headed into the Club House. Milling about in the Club House were a dozen or so archers. Noticing a gray haired, gray bearded bureaucrat in the crowd I asked him what was happening. He explained Schrader’s was sponsoring a charity 3D archery event. The charity was for the Delaware Premier Outdoors DPOA Kids program. Totally unprepared for a 3D Tournament, I filled out an entry form, paid the entrance fee, ran back to my truck, grabbed my bow, pocketed an untested release, stuffed four arrows into a quiver and sprinted ad libitum into the woods. I’d been teamed with several stoics, who’d previously arrived, to complete a shooting quartet. In the woods, the first target was on the left. Still catching my breath following the jog from my truck it became my turn to shoot. A replicate coyote sat about 25 yards away from the first course stake. After taking my shot, I took my bearings. On my right was the last of today’s targets; there were only 20 targets for this event. The 20 targets were arranged in a large circle through the woods. Each target was staked and numbered. At the target 20 stake, which closed the 3D loop and adjacent to stake 1, there seemed to be a campsite. To be fair, it was a cluster of people and supplies resembling a roving campsite managed by four archers. In addition to the archers, were two spectators apparently along for the exhibition. Their bivouac included portable chairs, two small coolers, extra clothing that hung off the chairs, umbrellas bracing seats, provisions were available and being enjoyed, and laying about was spare archery gear for emergency or supplemental use. People mingled, ate, drank, and chatted. Studying target 20 an archer was aiming, next he drew his arrow, then let down his arrow, verified the target through binoculars, re-aimed, re-drew, let down a second time, re-checked through his binoculars, while professorially addressing his colleagues between postures. Following great and wondrous deliberation, this real life Sagittarius, naturally in the Open Class as indicated by the multiple stabilizers, assortment of unknown protuberances, and large scope on his bow, released his shot. The arrow smacked the rubberized modeled animal, a large boar. In unison, as if choreographed, the group at stake 20 inspired then lifted and peered wide-eyed through their binoculars. The assembly then lowered their optics, huddled and debated the shot. The team must have been conferring as to how best to approach the synthetic boar locked in place at number 20. My group was poorly, even embarrassingly provisioned. We had no chairs, no water bottles, no food, no coolers; we lacked extra garments, carried limited archery gear, only 3 – 4 arrows each, and no umbrella. We were at the mercy of the wooded wild. To worsen our situation, the composite attitude was every man for himself. Among our collective, no one was interested in sharing strategy. Conversation was discouraged. We traveled light and fast. Although we were socially awkward, we ranged effectively – silent, covert, almost like Ninja. We gathered no admiring spectators. No one ever let a bow down. Never was there more than one quick glance though binoculars. We shot then ate up the distance between us and the encampments ahead, literally “playing through” two groups temporarily immobilized at numerically growing stakes on the course. I don’t know is any our meagerly supplied and silent group placed well in the event. However, if there had been a prize for fastest time through the maze of mock animals, we’d have certainly been among the victors. Upon completion of the event I’d only shot 20 arrows. This was far less than I’d planned for the day. I’d also not planned to shoot 3D targets much less actually compete in a tournament, at least until I’d practiced at varying distances. Still, the event wasn’t too bad. I had entered the course with four arrows and existed with the same four arrows. My worst shot had been a 5. Sorrowfully, we don’t have Mulligan’s in archery. The day had been a tease of spring. It would soon snow, again. My morning practice plan had been completely busted. The result was an unanticipated, aerobically challenging, short 20 targets, sprint 3D event. Sometimes, plans change. Sometimes, in archery and life, we end up unexpectedly putting it on line. Often times when plans get busted there is a silver lining. And eventually spring will come, along with its outdoor 3D tournaments. The guys at Shore Sportsmen are replacing their store’s carpeting. They moved a lot of inventory to their attic storeroom. 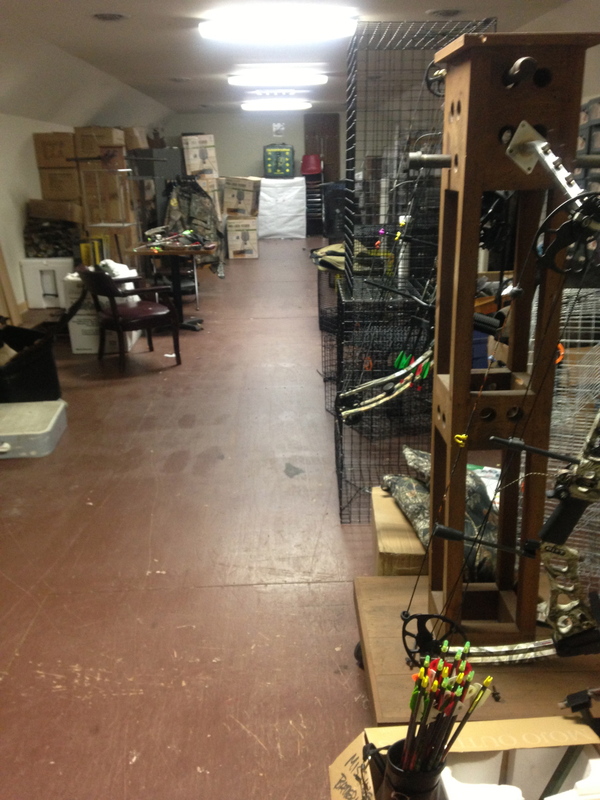 As a result their upstairs archery range was closed yesterday. The range is basically a target set back 17-yards against the far wall of their attic storeroom. Primarily, they use this to sight bows for customers. For other non-sales use there is a small fee to use the range. 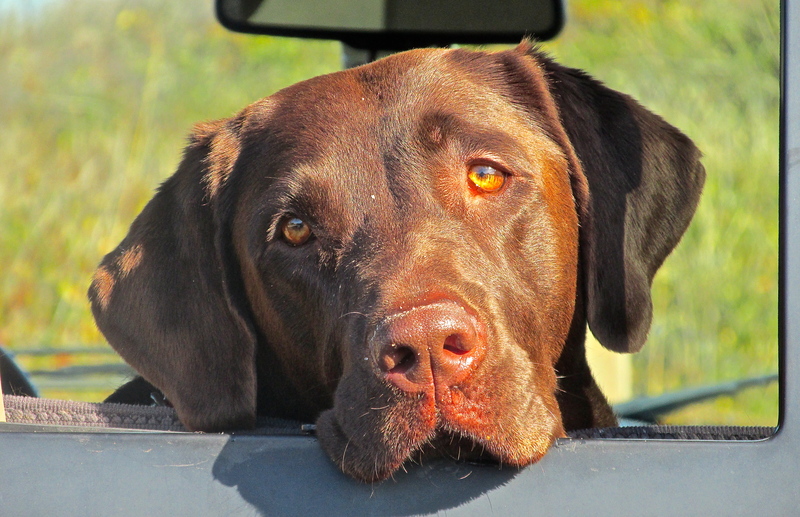 For me, it is very convenient taking about 3 minutes to drive from home to Shore Sportsmen. Jamie, the owner, said the attic range should ready for use today. I am looking forward to getting back upstairs to shoot. “Shoot well, David.” Standing on the line to shoot, hearing the call from a friend behind me, I am already beginning to miss these archers. I replied, “I’ll try not to shoot out the lights”, which sadly, was a distinct possibility. Some friendships take time to cultivate. Other friendships are instantaneous. This group was no different. 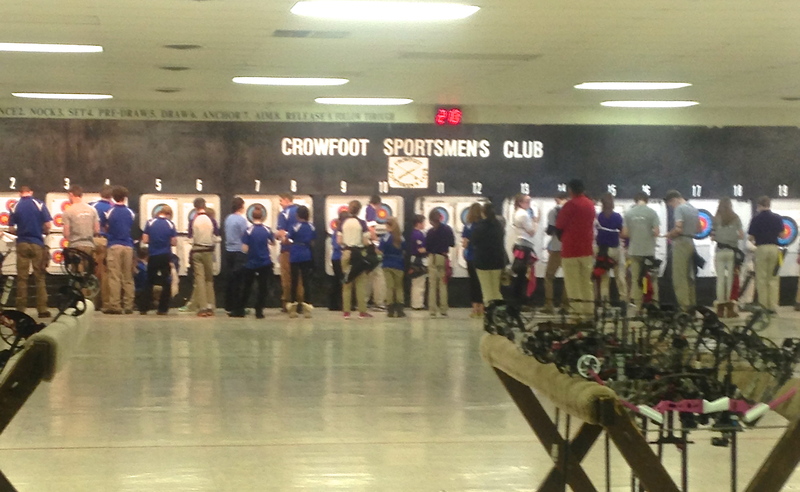 During the past six weeks, the social and athletic mixture of the 2014 Cypress Creek Archery Indoor League Competition evolved. 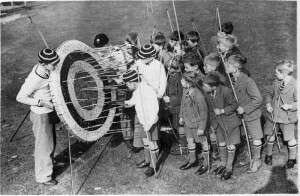 Friendships grew and so did archery skills. On opening night, week one of the Tuesday Cypress Creek League Competition, I knew two people: Norman and Paul. I’d met them at a 3D shoot held by the Tuckahoe Bowman’s Club. Aside from them, everyone was a stranger. This first week, I imagined everyone except me would be flawless shooters. That first night was quiet and intimidating. Paul and Norman must have recognized my discomfort, so they made covert conversational efforts to ease me into the group. Afterwards, driving home, I’d remember only three names, including Paul and Norman. Week six, on the last night at Cypress Creek, events and relationships played out much differently than the first week of shooting. Lining up for perhaps the third end of arrows, Chris was shooting next to me. We hadn’t shot yet, but everyone was getting focused. As Chris lifted his bow, someone, I didn’t see whom, approached him from behind (approaching a line of archers preparing to shoot from the front is simply not smart), and said, “Here take these peanuts back. I had enough of them, I am sick of peanuts,” while stuffing a bag of peanuts into Chris’ right pant pocket. Chris, standing on the line, bow in hand, arrow notched, said, “How can you be sick of peanuts? I love peanuts, any kind of peanut. I can live off of peanuts.” The peanut debate subsided and we shot. Wesley explained, “When I got home from shooting on Sunday, I put my bow, quiver and arrows on the bed.” He was pulling out his cell phone as he spoke, “here, let me show you why,” he said as he brought up a picture on his phone. The picture showed the remains of his arrows. The fletching had been chewed off of every arrow. Apparently, Wesley’s new puppy has a penchant for chewing fletching. Everyone in the room and on the line overheard the conversation and there was sympathetic and good willed laughter. Several minutes later, the waiting area and range were once again silent except for the releasing of arrows and the sound of arrows popping into targets. As the firing lines rotate and archers focus, Paul floated a question. Let me pause here to say Paul has one of those voices that carry. The room and range were silent. Paul’s unintentionally vociferous question, “ So Wes, are you looking for a new dog?” On the line, several arrows were let down as laughter fills the room. I didn’t catch Wesley’s wife view on the partially consumed fletching; Carlita was busy working to outshoot the guys. For recording scores this sixth and last Tuesday night of league competition, I was paired with John. On one hand, being paired with John was good because I knew he would be considerate of any malfeasance caused by one of my arrows. On the other hand, it would be humbling because I knew I would have the immediate comparison of my score with his 300 and 30X-27X per end evening. Our scores panned out pretty much as I predicted. On this last night, Paul shot next to me and scored a 300. Clustered around me, Kurt, as usual, shot 300 and a 21X and Chris and Dave probably shot around 300. I cranked out a 294 with 10Xs (sadly, not my worst night). Ultimately, John fired the last shot of competition while someone in the background whistled the tune to Jeopardy. This league’s shooting is now closed until 2015. Time to pack up and head home. Before anyone thinks too highly of my second place, let me put it in perspective. I shot in the Open Class – less shooters than the hunter class. I showed up every week. Hence, I had the advantage of six weeks of combined scores. 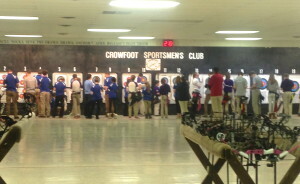 Others that didn’t shoot every week had fewer points to accumulate toward their total score. I am not 100% certain of overall attendance and how it elevated me but it seems to have helped. What I can say for certain is I will miss Tuesday nights and the good folks who competed in this league. River has posed wearing medals I have earned in triathlon, running and cycling. It started for fun; I put one around River’s neck and took a picture of her. Then, it became a game for her. 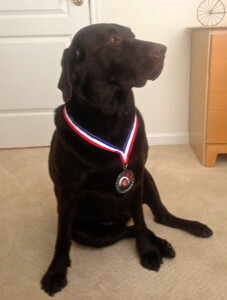 Now, whenever she sees a new medal she sits in front of me and waits for me to put the medal around her neck. Then, she strikes pose while she is photographed. Here she is with a medal I got in Virginia for archery. What’s your average score as an archer? Does this change with the changing of equipment? How would you know? Jackie Wilkinson is a 5 time British Field Archery Champion. In her book, Succeed in Sports, she describes her methods of tracking practice as an archer. On May 9, 2013, Reo Wilde, a World Champion professional archer, (at Reowilde.com) describes his practice and how he prepares for indoor and outdoor tournaments. He also writes about how he uses “group tuning” to help his shooting. What they have in common is a record of their training. In all sports, the top athletes, record, monitor and evaluate progress. Of course, training is not simply about keeping a tally of practice. Our practice has to translate to performance in competition. In Wilkinson’s book she provides an index of training methods for: golf, hammer throwing, running, tennis, and other training specific activities. How does an archer provide training advice for other sports? She points that some techniques for improvements crossover disciplines. Training and preparing for any event can be enhanced with understanding goals and having a defined schedule for training. 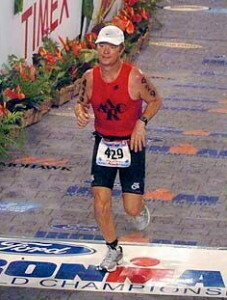 For triathlon, I have used a sophisticated computer program that generates my daily work specific to the degree of exertion level, distances, and rest periods. It logs my workout and matches it to my plan. In the 1970’s, as a competitive cyclist, we used paper logs and were coached through the process. In archery, relying on decades of training program experience, I have created a structured program for practice. This program uses an Excel spreadsheet to record, equipment, poundage, release type, range, running averages, and other variables. Some of the data can be graphically displayed. These graphs provide information that becomes useful for periodization and problem solving. While practicing at a range in NC a gentleman approached me to brag that he shot 30 arrows a day in his back yard. He added he’d been shooting for 20 years. Watching him it was clear he could shoot. But, even with my inexperience, I could see he had room for improvement based on his groups. I doubted his training was more than shooting 30 arrows a day. And with those shots I expect he made no measure of this level of proficiency or technique. Recording and storing your data is not time consuming. By creating a simple log, establishing goals, then measuring and analyzing your performance, you take the guesswork out of Putting it on the Line.